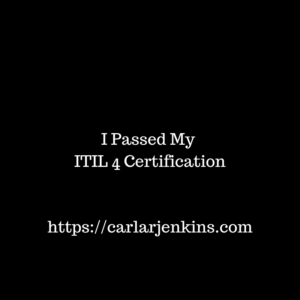 I have a huge announcement : I passed my ITIL 4 certification! I scheduled it on March 31st because I wanted to end my first quarter 2019 on a high note and I did scoring 80% (I needed 65% to pass). Passing the ITIL 4 certification served as a springboard propelling me into the 2nd quarter. I feel that I will get even more mileage out of this certification in the IT service management arena in the next 90 days. As always, still subscribed to Carla’s Correspondence to never miss a minute of it!